Hi I am Ashlie, Amanda’s sister and I am back with another edition of 7 Pins in 7 Minutes. If you are a faithful Kuzak Closet reader then you know that I help manage the Kuzak Closet Pinterest pages. Follow along with me as I click through Pinterest. Here are 7 Pins that caught my eye! I want to hang out here! What a perfect spot to relax and read a book! This article has great tips of how to get beautiful blooms from your Clematis. Some of the different varieties I had never seen before. I love the idea of a Squirt Gun Refill Station! 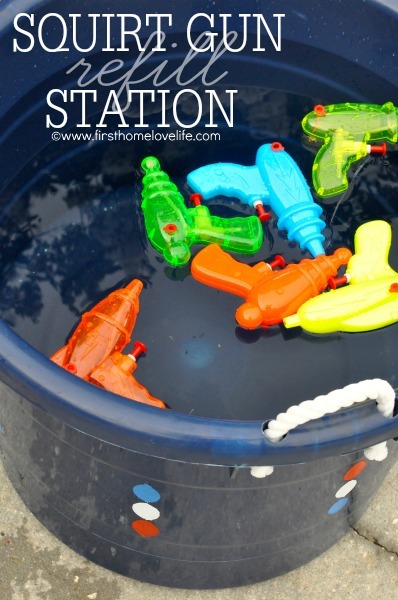 What a fun idea for a HOT playdate! Taste of Home has the best recipes and these Mini S’mores look awesome! My girls would love to help with this one! This festive flag display is so cute! The combination of ferns and flags are timeless! I had this pasta salad a few years ago and it was delicious. When I saw this Pin I knew I had to save it so I could make it this summer. One day when I redo my kitchen I would love to have a pantry like this! I am betting my sister could help with the process! Thanks for stopping by! Be sure to follow the Kuzak Closet Pinterest Pages. Next time I will be back with a special 4th of July edition of 7 Pins in 7 Minutes!